Continuing our series on historical photographs of China, this week’s blog looks at John Oswald’s photographs of Foochow [Fuzhou]. 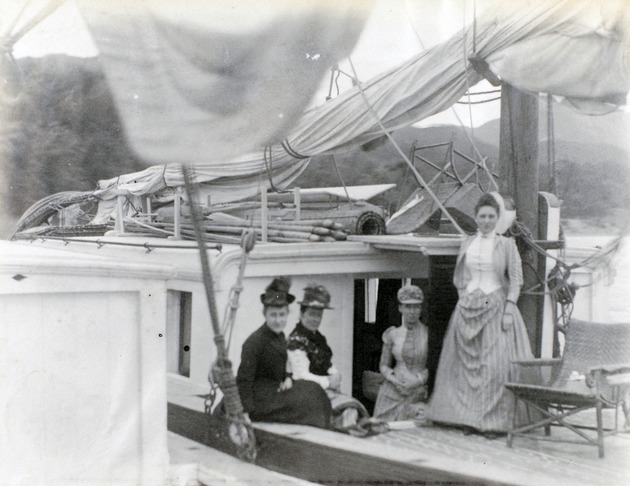 His photographs document the home, work and social life of a British tea merchant living in a treaty port. 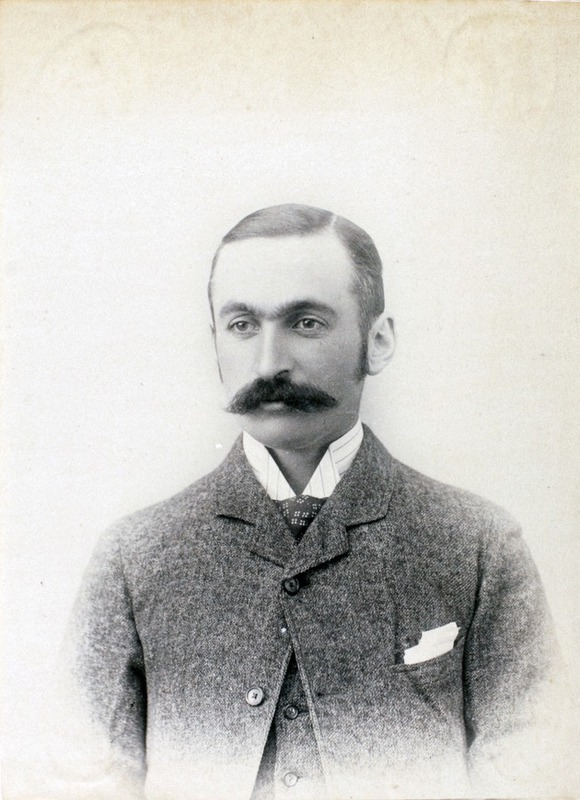 John Charles Oswald (1857-1930) arrived in Foochow in the late 1880s, having worked for a tea importer in London for thirteen years. Initially working for Odell & Co. as a clerk, he moved within a few years to Bathgate & Co. where he became manager and partner. Oswald combined his work for Bathgate & Co. with work for other firms, such as Fairhurst & Co. in the 1900s, and he was also consul for the Netherlands from the 1890s and later vice-consul for Norway. Foochow was one of the first five treaty ports opened in China following the Treaty of Nanking in 1842. Exports of tea increased markedly from the 1850s, making Foochow a significant port and leading to an increase in the numbers of foreign residents. By the time Oswald arrived in Foochow there was a substantial community of Europeans and Americans living on Nantai, an island outside Foochow’s city walls. The foreign community in Foochow was large enough to support a varied social scene. By the 1860s there was a billiards club and a fives court, and in 1871 the Foochow Club was founded. 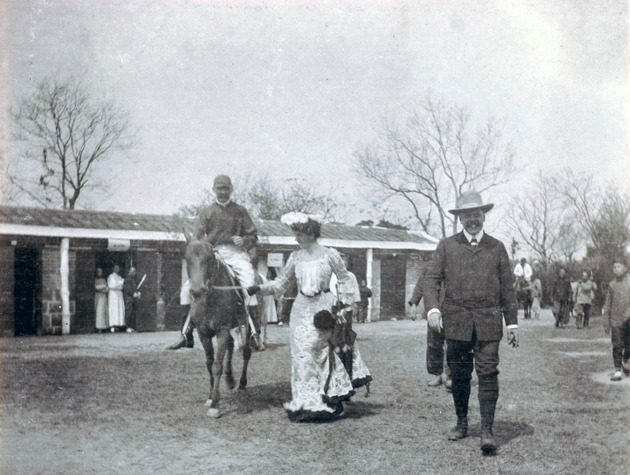 In 1882 a racecourse was established and results of the spring and autumn races attracted enough attention to be reported in the Hong Kong press. River excursions were popular, as were visits to the island of Sharp Peak or to the hills of Kuliang [Guling] in the summer months. Oswald’s photograph albums capture his participation in the life of Foochow’s foreign community. The eight albums held at SOAS Archives contain photographs of his friends and family, his house and racehorses, views of Foochow and the surrounding area, and a wide range of social events. These range from formal group portraits of Chinese and European dignitaries through amateur dramatics and fancy dress parties to more casual scenes on picnics or river excursions. Many of these social scenes could almost have been transplanted directly from Britain, and they reflect a European and American community living in China but following a determinedly foreign lifestyle. One of the photographs of Oswald in his albums is captioned ‘Mr Camera’ and he appears to have been a keen amateur photographer. Many of the photographs would have been taken by him. It is possible that the albums were compiled by his wife, Nina Louisa (née Day). The albums also include photographs taken by friends, for example Alex Gibb (of Gibb, Livingstone & Co.), as well as prints that would probably have been purchased. The latter include images of prisoners being punished and of executions, a not uncommon memento for Europeans in China (which can be also found in another of SOAS Archive’s collections of photographs of China in this period, the R.F.C. Hedgeland collection). 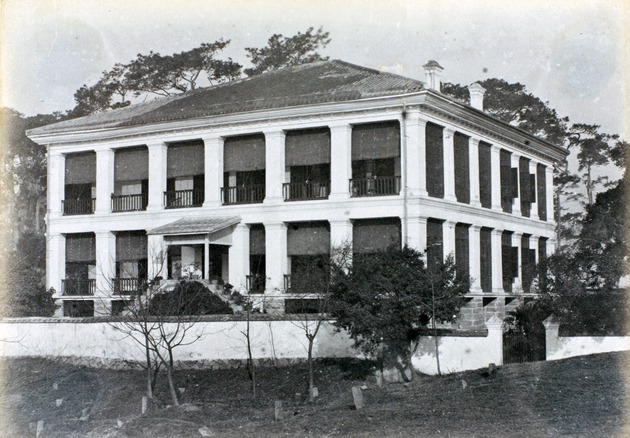 Tai Hing, Oswald’s home in Foochow. Tai Hing was the ‘hong’ or registered Chinese name of Bathgate & Co. This view shows the house after the porch had been added over the front door. Oswald’s bedroom is to the top right. 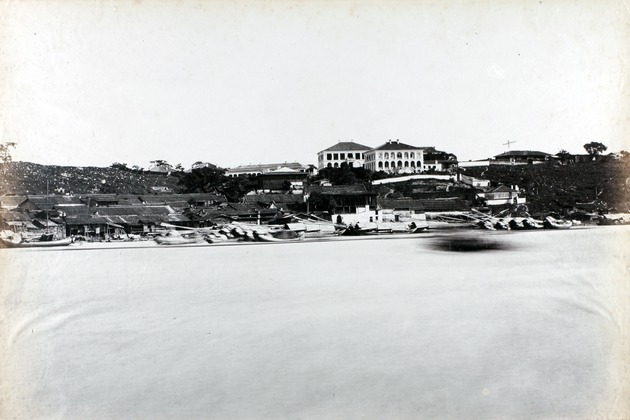 The building to the right of the photograph is the Odell & Co. bungalow, where Oswald stayed for three years when he first arrived in China. The Bathgate & Co. jetty seen during the floods of 1890. 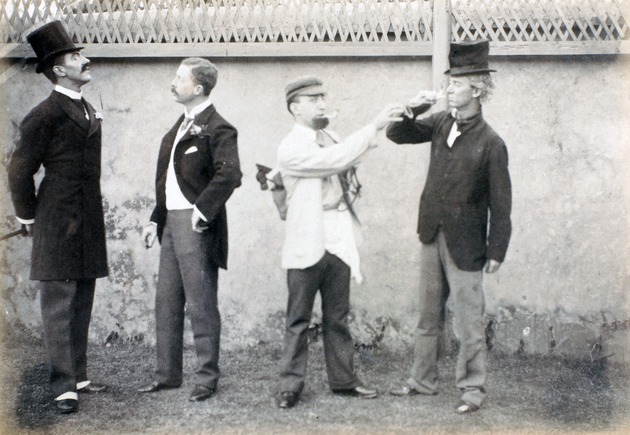 Characters from the play ‘Caste’ by Thomas William Robertson. Oswald’s albums include photographs of other amateur dramatic performances, including ‘Babes in the Wood’ and ‘Aladdin’, both possibly the works by Henry J. Byron. 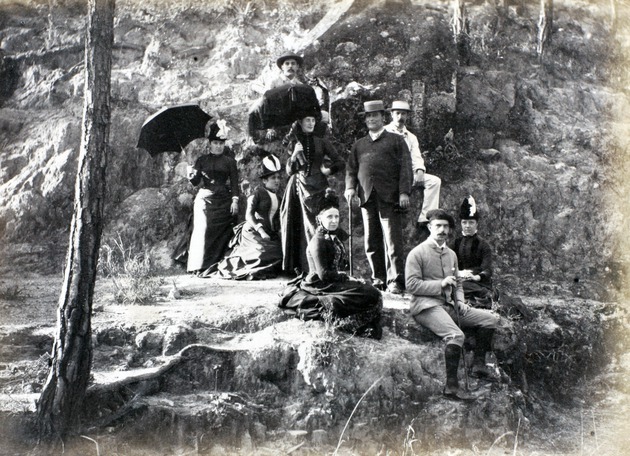 A picnic party in the mountains at Kushan [Gushan]. The monastery at Kushan was a popular destination in the summer, as the mountains were cooler than the city. 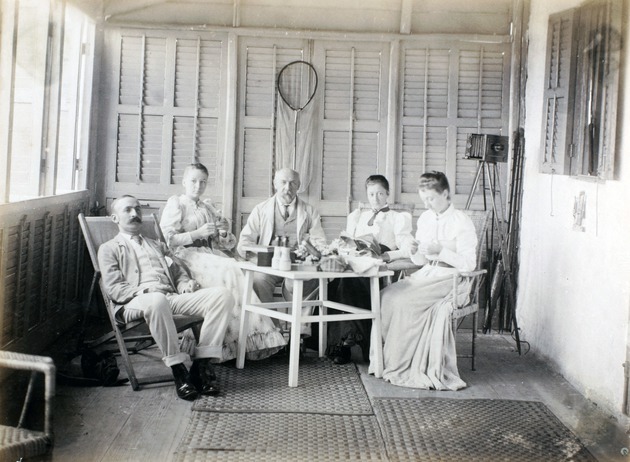 Oswald (far left) in a house at Kuliang [Guling]. Kuliang, on the Kushan mountain above Foochow, grew into a popular summer holiday destination, away from the heat of the city. Dr Thomas Rennie, who appears in photographs in Oswald’s albums, built the first house there in 1886 and he was followed by many others from the foreign community. At its height Kuliang had two to three hundred summer residents and even a post office. 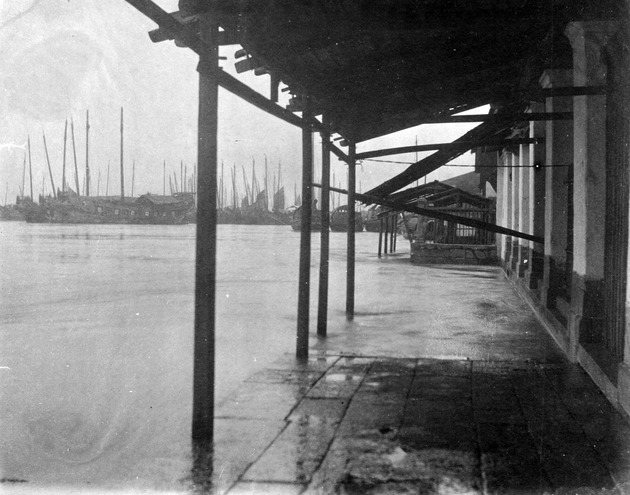 Excursions by river were a popular pastime in Foochow. This scene shows a houseboat trip on the Yuen Foo river. Further photographs from the Oswald collection can be viewed on SOAS Digital Collections as well as on Historical Photographs of China, alongside photographs of China from other SOAS Archive collections.